In a period and a context where originality was rather unimportant, but where devotional quality played an important role -when cutting production costs was always attractive – illustrations in books were rarely or never subject to copyrights. Hence, a multitude of variations of the illustrations appeared: as originals, copies of originals, reversed copies, copies of copies or in various degrees of borrowing motifs, elements etc. Thus, an illustration could cross national borders, denominational borders or even go from a more public to a more private use – from a title page to a devotional picture or card. The motif chosen here goes back to the early 17th century, at least to an engraving by Michiel Bunel. 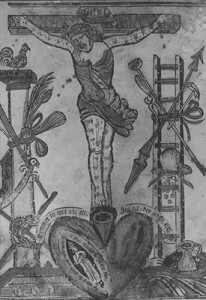 The disposition of the devout Catholic is pictured as seeking shelter in the Sacred Heart of Christ, the soul hiding in the side wound of His Heart. In doing so the soul literally immerses itself in the Passion of the Lord, that unique salvific event through which the believers are redeemed. 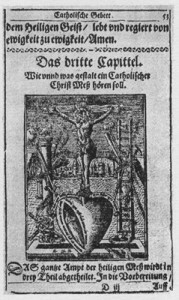 As one could read in a contemporary prayer book Preces et praxes, likewise published in Münster two years later, as the text under an engraving of the five sacred Wounds: O bone Jesu exaudi me: Intra vulnera tua absconde me, o good Jesus, listen to me: hide me in your wounds. The Passion is re-enacted in every Mass, where the sacrifice is remembered sacramentally in such a way that it once again becomes present and effective. Thus, Holy Mass was an allegory of the Passion, and prayerfully following and contemplating its progress was the right and devout way of attending Mass. Interestingly, around 1740 we find the same motif in a hand coloured Lutheran (Pietist) single leaf woodcut measuring 35×28,5 cm. (left) It was published by P. W. Brandt in Odense in Denmark. It is much larger than the German variant and appears in a simplified form, yet it is basically identical. The text below the main motif reads: O Menniske! Kom nærmer hid, See Christi Lidelse med Flid, betragtet her at være. Skue disse Instrumenter an, See en Korsfæsted Gud og Man En Torne-Krone bærer, O Human Being! Come closer, behold attentively the sufferings of Christ to be contemplated here. Behold these instruments, behold a crucified God and Man carrying a crown of thorns. The motif appears once again in another 18th century hand coloured variant, this time probably in a Dutch connection. (illustration on gallery front page) It is small sized, engraved, more like a devotional card with a prayer underneath. The inscriptions on the three variants do vary, and in the last instance the text around the side wound has simply disappeared. 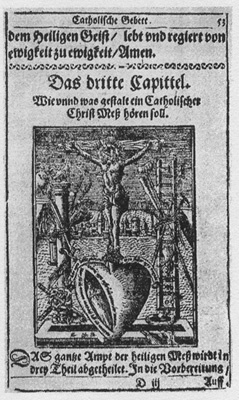 In this way the very same motif, of which the 1658-version may be the original, appears in different national, denominational and technical contexts. 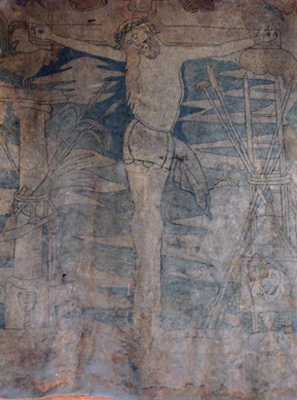 In the early 17th century San Miguel Franciscan mission church in Santa Fe, New Mexico, a painted piece of buffalo hide hangs on the wall (right). Though the painting has faded with time, it is still clearly a variant of our motif, Christ crucified, flanked by Passion symbols, and the foot of the cross placed in a heart. Even the tiny figure seeking shelter in the side wound appears. There are, however, no inscriptions. Since the roof disappeared in a fire due to the Indian revolt of 1680, not to be restored until 12 years later, the painting must most probably be dated to the years around 1700, or some decades later.